As one of our new year's resolutions, Mr. T and I are both trying to shed the pounds that we put on over the holidays. One bandwagon that I've decided to jump on is Meatless Mondays. I was a vegetarian for a year in college so this is a pretty easy transition for me, but a little bit harder for my meat and potato lovin' husband. I've tried to find hearty vegetarian recipes that still leave you satisfied. 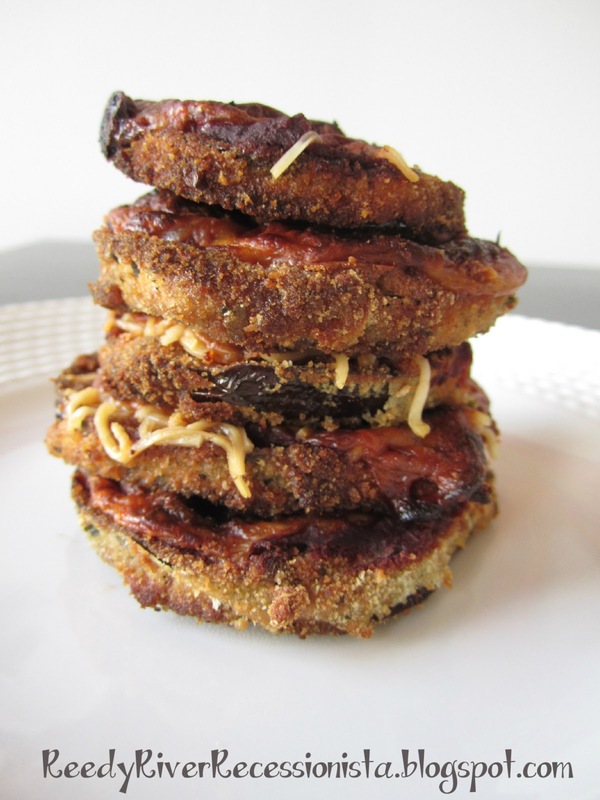 One of our absolute favorites are these Eggplant Parmesan Stacks. Preheat oven to 400 degrees F. Slice washed eggplant 1/2-inch thick. Dip slices into the egg mixture and then into the bread crumbs, coat well. Grease a cookie sheet with olive oil. Arrange each slice of coated eggplant in one layer on the cookie sheet and drizzle each piece with olive oil. Bake in the oven for about 15 minutes. Check that the slices are golden brown, turn them and drizzle olive oil over the tops. Bake for another 15 minutes. They should be browned on both sides. Set aside. In a small saucepan dilute the tomato paste with wine. A good mix is a can of paste and a can of wine. (This is the perfect use for that bottle of wine you have that is a day or two past it's prime, it's still okay to cook with) Add the oregano, salt, pepper, and crushed garlic. Spread 2 tablespoons of sauce on each slice of eggplant. Layer each eggplant with a slice of mozzarella and top with Parmesan cheese. Bake for 20 minutes. These are great served on their own, but also go well served over a pasta with red sauce. They do well leftover, too. Just pop them in the oven for 10 minutes at 375 and you're good to go. I think this looks delicious! But, my husband would not be too happy with Meatless Monday or any day for that matter. I'm definitely, definitely going to be making these soon. I think going meatless is a really easy way of cutting calories, and it also benefits the environment. One of our favorite ways to go meatless is to do big portabellas. We treat them as pizza crust and top ours with each of our favorite toppings ... sundried tomato pesto, capers, kalamatas, and cheese is my favorite combo. Great on the grill in the summer, but they can also be done in the oven. These sound really good! We've been trying to eat healthier the past couple days (just started) so this is definitely a recipe I'd like to try. I couldn't cut meat out completely and I think I'm safe to say my fiance couldn't either, but it might be nice to cut down on some (we have it almost every night) and replace it with veggies. Thanks for the recipe!